What constitutes corporate responsibility is an oft-debated question. This truism, if you like, certainly applies to the pesticide industry (because of its environmental and health ramifications). 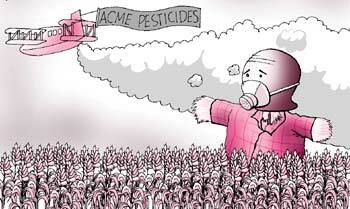 Despite increased awareness about damages caused by pesticide use, their use continues to expand. Alternatives exist, but deceptive marketing ensures the farm sector is happy dumping ground for chemicals. Nevertheless, current donor and activist attention is sadly diverted to biotechnology; its as is the pesticide problem has been solved. Given this situation, the Rockefeller Brothers Fund brought together concerned scientists, lawyers, investment professionals and sustainable agriculture advocates to pow-wow over the pesticide industry's accountability. The forum met at the Pocantico Conference Center in June, 2002. This book records what transpired there. The report asserts that current levels of pesticide consumption are not necessary to maintain food production. Rely less on toxic chemicals, it argues; manage pests in a more ecologically friendly fashion. If we reduce pesticide reliance, we directly come up against the industry's vested interests. And force it to be accountable. 6 kinds of arclights train their glare on the industry: legal liabilities, market trends, regulatory trends, quality of management, reputational risks and long-term uncertainties. The report analyses these risks and liabilities in detail. 3 legal strategies - forum non conveniens, pre-emption and defenses to products liability law - were important to corporations to defend against liability; recent developments have taken a lot of such teeth away from them. Both the developed and the deve-loping worlds now have stringent rules for pesticide use, which alters the cost of doing business. Thus, the report contends, the market for pesticides will eventually shrink, even more so as the public refuses to carry the baggage of pesticide costs and risks. Management quality, interpreted as compliance to various national and international standards - say, the food and agriculture organization's international Code of Conduct on the Distribution and Use of Pesticides - indicates the financial health and investment prospects of a company. But is it not also true that companies are notorious for the way in which they bamboozle Third World countries? Are they not great evaders of environmental regulations? These, and other concerns such as safe disposal of obsolete stocks, non-compliance with export and shipping formalities, products shipped interstate (raises the cost of disaster response), are discussed at length. The prevalence of such practices are significant risks to a company's reputation, making it vulnerable to market forces. When companies say their products are in-house tested, one today reacts with disbelief; the 1984 explosion and release of toxic gas from the Union Carbide plant at Bhopal seriously altered the way even companies view their liability. And recent research on the impact of pesticides on health and environment have thrown up unexpected data and revelations. The report asks if such risks are adequately acknowledged and accounted for in financial markets. Obviously not; how else could the markets blandly accept the huge amounts of toxic stuff pesticide companies routinely market? In this context, the report argues for greater awareness of the true risks and costs of pesticides, and puts forward the idea of a socially responsible investment community. The report concludes by advocating increased research about individual companies and their products so as to facilitate better understanding among the various key players in the pesticide industry worldwide, improved data disclosure by industry and establishing greater legal and financial liability for the negative health effects of pesticides - all this to transform the investor's perception of risk in this industry. The report is comprehensive not only in terms of dealing with a wider range of issues affecting the pesticide industry, but also in taking up the finer aspects. Voicing the views of the conference participants, who stressed that the time was ripe to make the industry more accountable, the report ends on a positive note. It suggests the conference provided a clear sense of "how we might 'connect the dots' between different reform efforts". Reading the report, one truly feels that the pesticide industry's days of skull-duggery are over.